Solar Passive Design takes into account your site’s location and orientation, prevailing weather patterns and wind directions. The end goal is to achieve a home design that is comfortable year-round with minimal additional heating & cooling requirements. Solar Passive Design uses the climate to maintain a comfortable temperature range for the home by harnessing natural sources of heating and cooling to maintain an ambient temperatures in the home. Using the climate and prevailing winds are energy efficient and environmentally sound means for effective cooling of a home. Simple design, energy efficient homes and locally sourced materials ensure our building process is built on sustainable principles. Building any home involves making a statement. 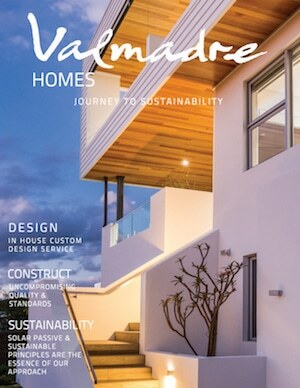 The Valmadre team believe that the best homes are the ones that compliment their environment without costing the earth.